Hand smocked clothing appeared in Europe around the 12th and 13th century. This style of clothing was referred to as smock frock or simply smock. Smocked clothing was traditionally worn by people such as shepherds and farm hands, living in rural areas and throughout England, and later in countries like Italy and Germany to name a few. The smock clothing style would soon expand out of the rural areas and into the cities where it was worn by adults and children. Smocked embroidery would adorn baptism and Christening gowns, girl's bishop dresses, smocked coveralls; while adults would be seen wearing hand smocked casual and elegant embroidered clothing wear. Smock embroidery is where fabric is taken and folded into an accordion fashion, these are known as pleats. A string is then taken and sewn through these pleats in various areas in order to hold them into place. Then using colored thread and needle, the tops of these formed peaks of the pleats are adorned, by hand embroidering small figurines such as flowers or pictures depicting small animals, or other lovely scenes. The style and types of stitching found on smocked clothing are numerous, stitches known as, honey comb, cable stitch, and the smockers knot, to name a few. The areas of the clothing, which were usually smocked, were the cuffs, chest, and waist areas of the garments. This would make the garment into a loose fitting style outfit, and would become a traditional fashion of its time. Making smocked clothing is a labor-intensive task and not an easy one. A smocked garment is usually assembled from sections, then carefully adding the hand embroidery portion were needed, at times the pleated section is embroidered separately, then added to complete the outfit. As you could well imagine completing such a task would take days if not weeks to complete, but once finished, the outfit would become, one to be treasured and one of a kind heirloom. A keepsake to be cared for and preserved, sometimes passed on down among family members. Welcome the industrial revolution of the 18th and 19th century. This turn of the century would bring machinery that would make it nearly impossible for the laborers to use the loose fitting smocked outfits, or any other type of loose fitting clothing for that matter. Wearing such clothing around these industrial machines made of fast paced moving gears; could prove deadly and not make, a very safe workplace. It's not known if this was the main reason why hand smocked clothing would lose popularity around this same time, but very well could be one of the factors. Luckily the hand smocked clothing would resurface years for families to enjoy and cherish. Today, luckily there are alternatives to getting your hands on lovely hand smocked clothing. One alternative is to purchase what is known as machine smocked clothing. This is where all the smocking embroidery is done by machine and not by hand as they used to do in the early days. Some of the machine smocked clothing is lovely indeed and comparable but does not hold up to the true traditional hand smocked clothing. 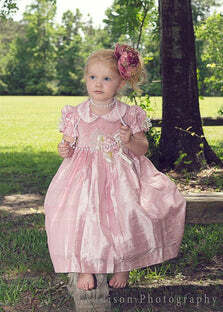 The other alternative is to find a great place to purchase traditional children's dress clothing like Carousel Wear. 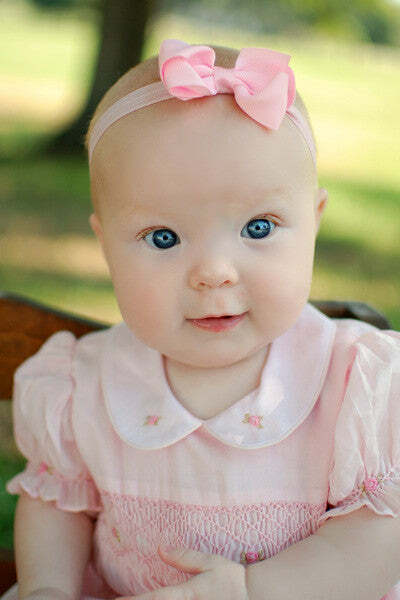 They offer a wide variety of hand smocked clothing from. 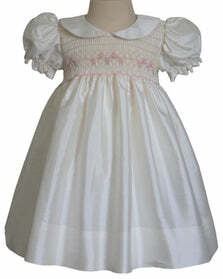 Christening gowns, baptism gowns, silk dress, smocked baby shoes, boys jon jons, girls bishop dress, flower girls dress, bubble outfits, boys outfits and more, for children that range in ages from newborn, infants; toddlers all the way up on up to age group of 8 year old. Carousel Wear also has something to offer the DIY; the do it your self person. A ready to smock dress, that comes fully assembled ready for you to smock. This style dress comes complete except for the hand embroidered design. All that is needed is to hand embroider your favorite smock design to its pre-pleated area, and your child will soon be wearing a traditional hand smocked outfit, to school, church or other family events and be the talk of the event. Imagine a hand smocked dress that you complete as if you had made it from scratch; the best part is that it comes at a fraction of the cost of what a completed smocked dress would cost. The best part is that you customize this dress to completion by adding your favorite design to the outfit and think about how much time you will save. Children's smocked clothing is popular in the USA and in the U.K and other parts of the world, especially if the parent prefers to dress their child in a traditional outfit, one that is a hand smocked. Smocked dress outfits have not lost popularity and are available today. Once completed these outfits make a lovely heirloom smocked outfit. When you think of hand smocked clothing think; CarouselWear.com visit them today and see how much you could save today. To learn more about smocking. Copyright 2011 by Carouselwear.com, no parts may be used without written permission.